The contrasting neck rim on the present bottle can be traced back to a strong trend in the Qianlong period at the Court in Beijing and which was subsequently adopted by the Yangzhou School. The chi dragons, also a popular motif at Court, suggesting a courtly origin (see discussion under lot 601). 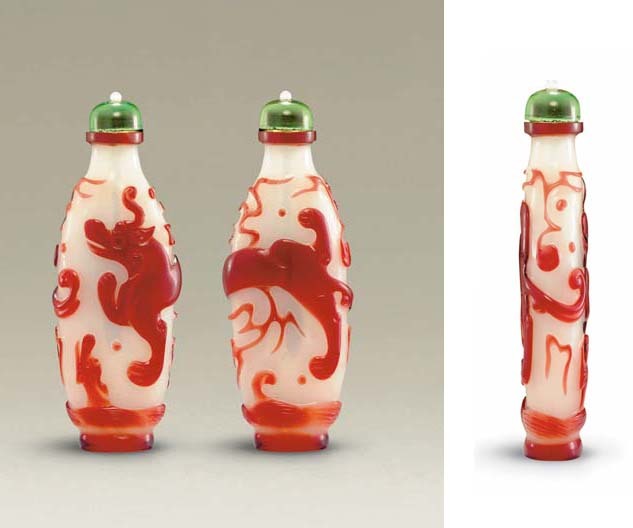 The playful, animated dragons are reminiscent of those on a red overlay white glass bottle in the Bloch Collection (see Moss, Graham, Tsang, A Treasury of Chinese Snuff Bottles, Vol. 5, Glass, no. 883), which is also possibly from the Imperial glassworks.